Standing on the quay behind Amsterdam Central Station — or, better yet, at a vantage point provided by the new, raised bus station — you are treated to a wonderful, panoramic view of the river IJ. Panoramic view the river IJ, as seen from the bus station at Amsterdam Central Station. This is where, during Amsterdam’s Golden Age, each day hundreds of cargo sail ships arrived — centuries before the train station was built. 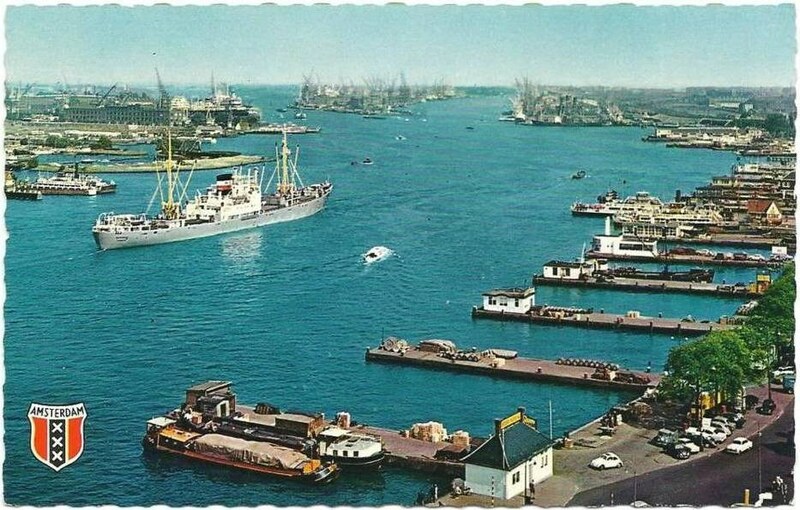 Nowadays the river features a never-ending parade: anything from tiny dinghies to huge cruise ships, from expensive yachts to priceless tall ships, and from glass-topped tour boats to cargo ships. On the other side is Amsterdam-North. Once a place where no true Amsterdammer would want to be caught dead, it is now a sought-after district with a great mixture of cultural hotspots, nature areas, incorporated villages and modern urban developments. • Lake, bay, inlet, or…? Tourists and locals alike use the free ferries that weave their way in between the other vessels to cross the IJ. Often overlooked by travel guides, there’s a wealth of entertainment to be found on and around the river. The banks of the IJ are home to such attractions as a world-famous creative community at a former ship wharf, a growing number of unique restaurants, the world-renowned EYE Film Museum, and world-class music venues. Just as important: there are lots of off-the-beaten-track places to chill and relax. Many tourists rent bikes and head for the beautiful countryside just north of the water instead of trying their luck in Amsterdam’s hectic traffic. Enjoy great coffee and fantastic sandwiches, served with genuine Italian hospitality, on the waterside terrace while watching the world float by. Italian coffee kiosk Al Ponte is right across from Amsterdam Central Station. Afterward, take a relaxing stroll along Noordwal promenade — one of those wonderful spots most Amsterdam tourist guides overlook. Alternatively, have an impromptu picnic at the Oeverpark just west of the EYE Film Institute Netherlands. Buy something the eat and drink at the Albert Heijn supermarket in Central Station, then take the Buiksloterweg ferry, and walk past the EYE building to the park along the IJpromenade. Situated right next to one of the ferry landings, the owner of Al Ponte could potentially get very rich selling tickets for the trip across the water. Every day countless tourists walk up to the kiosk’s window and ask how much tickets for the ferry cost. The answer: Niente. Nothing. Nada. Niets… The ferries are free to use for everyone. That’s because without the ferries — which are operated by the municipal public transport company GVB — many Amsterdammers could not easily travel back and forth across the IJ. But the bridge is 4.3 km (2.6 miles) — as the crow flies — from Central Station, which means that most people travelling back and forth between Amsterdam’s city center and Amsterdam Noord are dependent on the ferries. Since traveling by ferry is a matter of necessity, rather than choice, the city at some point promised that the ferry trips would always be free. The GVB operates 6 ferry routes across the IJ, which currently serve more than 15 million passengers a year. That’s up from 12 million in 2011 — a reflection of the growing importance of the Noord borough, where more and more people and businesses are settling. To be honest, no matter how often I use the ferry nowadays, I still get a kick out of it — and there are plenty of times when I take an extra trip or two across the water. And so can you. Why deny yourself one of life’s simply pleasures, right? 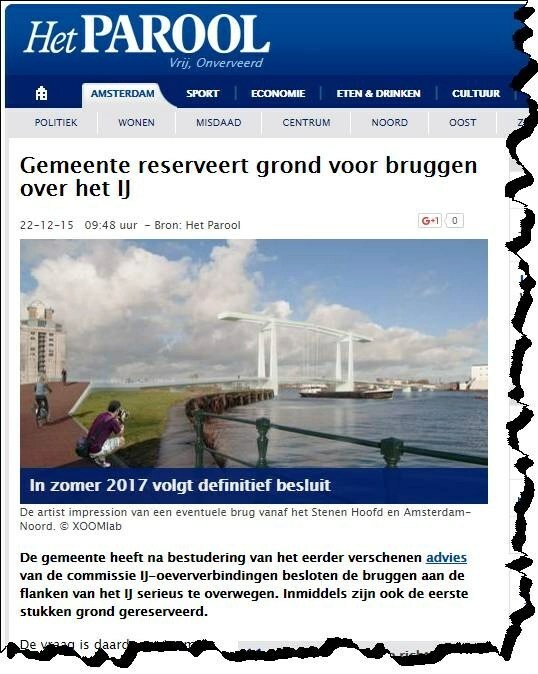 Another bridge across the IJ? There are six ferry lines across the IJ, serviced by eleven ferries which together costs GVB 10 million Euro a year to operate. During peak hours, or when there are special events in the city, the ferries tend to be overcrowded. Debarking on the other side can be somewhat of a challenge, as lots of people want to get on to the ferry while others are still trying to get off the ship. Recently the city painted huge red and green areas at the landings. If you want to board the ferry, wait in a red area until all passengers getting off the ship have cleared the green area. Most of the time it works, but there are plenty of selfish nutcases who don’t want to wait, and instead push their way on board through the flow of people debarking. The on-going growth in the number of passengers, the cost of new ferries, and the limitations imposed by sailing back and forth across a busy, international waterway, have given new life to old dreams. Since about the middle of the 19th century people have been talking about the possibility of building one or more bridges across the IJ. 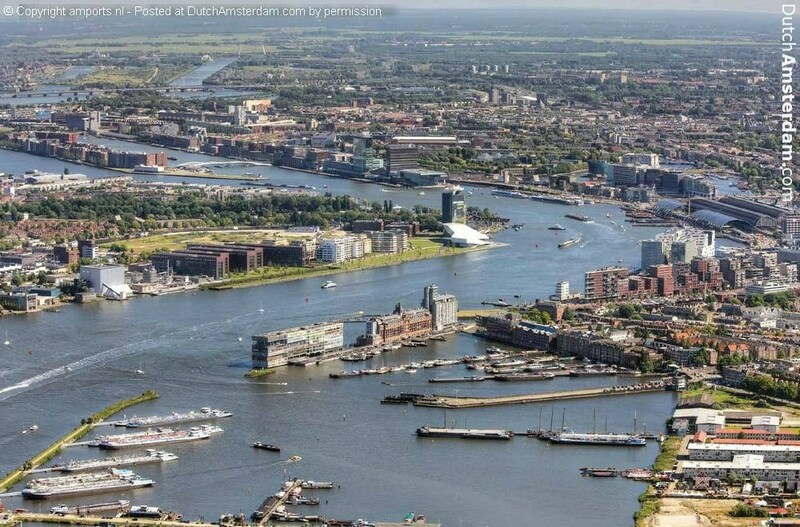 The Amsterdam city council wants to built one or more bridges across the river IJ. Nowadays the city is seriously looking into the possibilities, and has asked the citizens of Amsterdam to help think about possible solutions. Suggestions have anything from dedicated tunnels for pedestrians and cyclists to cable-ways. The latter are said to be impractical and too expensive. The former would be costly as well. Tunnels must be laid very deep in order to accommodate cruise ships. And not every bicyclist would be able to negotiate the steep inclines. Anyway, the city council is expected to make a decision on the issue in 2017. If approved, the bridges would become reality some time between 2020 and 2025, at an expected cost of 130 million Euro. In anticipation, the city has already reserved the necessary plots of land. Many commuters, noting the rising popularity of ‘Noord’ along with the overcrowding on the ferries during morning and evening drive times, would love to see those bridges become reality. On the other hand many Amsterdammers, including lots of ‘Noorderners‘ are against such plans — for a variety of reasons. For one, we generally don’t trust City Hall with big, money-eating projects (e.g. the way-over-budget Noord-Zuid metro line). For another, there are all manner of practical considerations, such as the fact that 150+ cruise ships a year visit the harbor. How tall would a bridge have to be — and how hard would you have to pedal your bike across a windy bridge? If the bridge opens instead, how often and how long would you have to wait each time that happens? And there are plenty of people who wish to keep North ‘to themselves,’ so to speak. There are economic considerations as well. 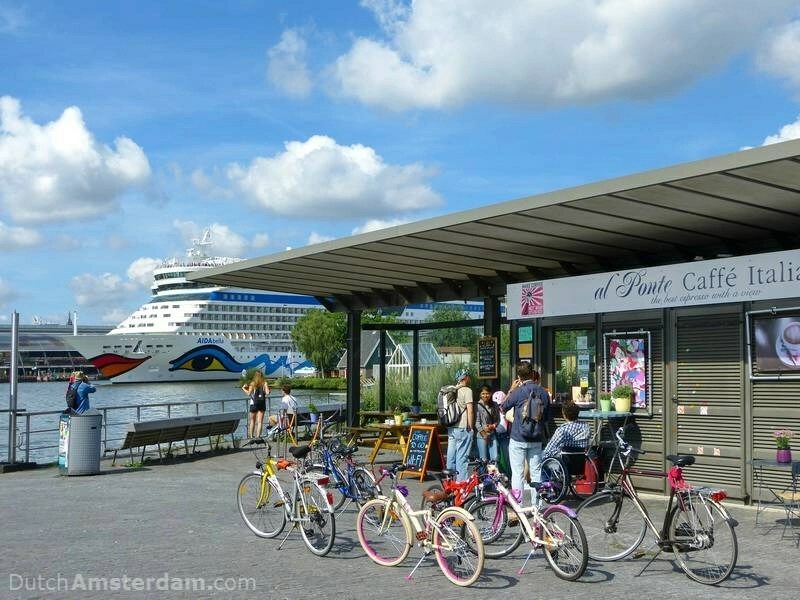 Most proposals for possible bridges call for the Passenger Terminal Amsterdam (PTA) — the cruise ship terminal — to be moved from its current position just east of Central Station to a location in the commercial port district. Studies into the bridge issue mention that doing so may negatively impact Amsterdam’s burgeoning cruise ship business. Cruise agencies may decide to bypass the city if passengers have to be ferried back and forth between a remote port location and the center of town. Mind you, each cruise ship represents an economic boon of about €500.000 Euro. On average Amsterdam welcomes 137 such ships a year — and this number is expected to grow to 250 by 2030. The river IJ, seen in easterly direction. Central Station is at the middle-right. © Copyright, Peter Ellenbaas Used by permission. The Port Authorities are not happy with the talk about bridges either. The IJ is an international ‘corridor’ of great importance to the logistic and economic position of the port. Messing about with bridges — and even the slightest possibilities of delays or safety issue — is, in their eyes, not an option. At one time the controversial Noord-Zuid metro line had a station planned for the yacht harbor location just across from the Buiksloterweg ferry landing. But it was axed in one of a series of budget cuts. Can you swim in the river IJ? Not officially, but there some ‘wild swimming‘ spots where people do take to the water. Is it a river, a lake, an estuary, an inlet, or a bay? Throughout the centuries the landscape of the province of North Holland, in which Amsterdam is situated, has undergone many drastic changes in an ongoing battle between land and water. 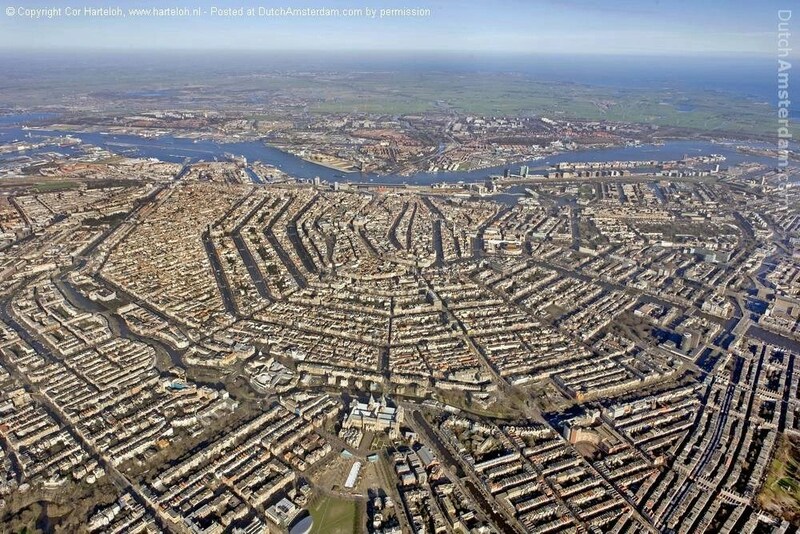 On successive maps of Amsterdam and surroundings you see that the shape of the IJ has also constantly changed. That is one reason why people refer to the body of water with different geographical terms. In tourist guidebooks you’ll see the IJ called a bay, and inlet, a lake or a river — and at one time or another each of those terms were true. Officially the IJ is a link in one of the eight ‘national water corridors’ in the Netherlands. Most such waterways are managed by Rijkswaterstaat, part of the Ministry of Infrastructure and the Environment. However, the IJ is managed by the Port of Amsterdam (Havenbedrijf Amsterdam). The official websites run by the city also call the IJ a river. Naturally, DutchAmsterdam follows suit. 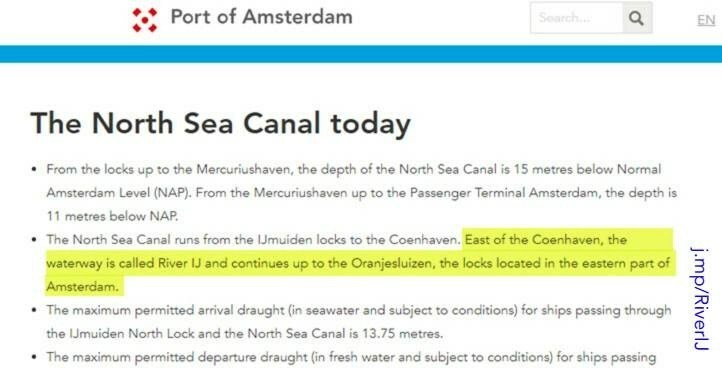 And yes, while Rijkswaterstaat’s current website simply mentions “het IJ,” its old website also referred to the IJ as a river. Incidentally, the nickname “het Blauwe Plein” — the Blue Square — has never really caught on. Video: Time-lapse of the busy river IJ. Knowing a thing or two about this river will greatly aid your understanding and enjoyment of Amsterdam itself. After all, currently one of Europe’s busiest waterways — connecting the North Sea and the Port of Amsterdam with the rest of the continent — the IJ has played an important role in the history and development of the city. Aerial view of Amsterdam, as viewed from the south. Central Station is in the middle, alongside the river IJ. And the city is still expanding around the water. Note the new developments to the east, to the west, and right across the IJ. Right here, where the delta of the river Amstel met with the IJ, a small trading post was established around 1220. A lot of trade traffic took place on the Zuiderzee — for instance with ships sailing between such Dutch cities as Kampen and Deventer, as well as towns along the Baltic Sea. The growing village of Amsterdam was ideally situated to serve as a key trading spot for products going to and from its back country to the south and west. 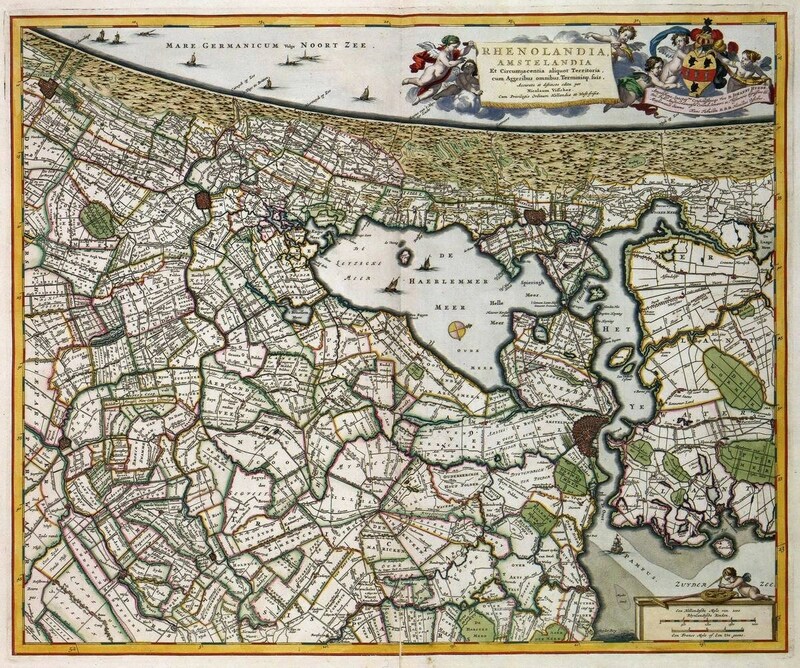 This 1681 map is orientated with the North Sea — west of Amsterdam — at the top. The river IJ, here still called Ye, reached almost to the dunes. Plus: information about the North Sea canal, the Port of Amsterdam, harbor cruises, cruise ships, the ongoing ‘should we build a bridge between Amsterdam North and the center’ debate and more. This map in in progress. Additional information will be added shortly. • Give Café De Pont a miss. Really. You deserve better food, and better service. • THT/Tolhuistuin is a relatively new spot located in the former canteen of the Shell HQ (the tall building next door, which is currently being transformed into a multi-functional cultural destination). Its ‘shared tapas’ concept is well-received, and we hear lots of positive comments about service and prices. • The EYE Bar and Restaurant provides fantastic views but is short on atmosphere. It gets mixed reviews regarding food and service. ‘A notch above bar food,’ one diner says. ‘You pay for the view,’ another writes. • Il Pecorino has a great location, but reviews for its food and/or service are all over the place. Or, as one reviewer at TripAdvisor summarizes: “You will either love it or hate it.” Based on our own experiences at Café de Pont, operated by the same owner, we haven’t visited this place. • Hotel De Goudfazant is not a hotel, but a highly-praised restaurant situated in a former garage that still pretty much looks like one. Someone it all works. A bit of a challenge to find, but you’ll be very glad you made the effort. Highly recommended. • Pllek. A restaurant built with former shipping containers. Facing the IJ. With an artificial ‘city beach’ and all-around good vibes. The casual food ranges from good or very good to slightly above average. Service could be better. You don’t go here if you’re in a hurry. 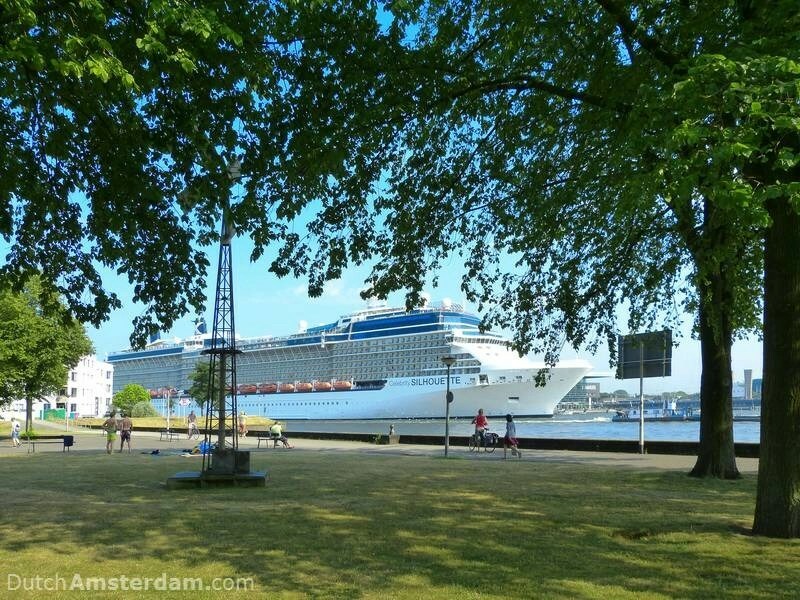 This live webcam cycles through various views: an overview of the IJ (close up and wide-angle), KNSM island and the quay of the cruise ship passenger terminal (PT Amsterdam), and Amsterdam Central Station.